Which disorders responded to PhotoMed’s algorithm? 400+ volunteers attended clinics and studies designed to identify disorders that might respond to PhotoMed’s non-invasive algorithm driven therapy. The studies included people who were not expected to improve. Many volunteers had years of care from PhotoMed’s advisory pain-specialty anesthesiologists and neurologists. For eons, people have recovered from horrible injuries without modern medicine. So one’s healing shouldn’t be a surprise. Years and previous failed attempts lowered everyone’s expectations towards zero. It’s the “when” that makes PhotoMed’s examples feel like magic. Should it be surprising that the “when” is frequently marked by a flinch, gasp, or spontaneous exclamation? Practitioners of many non-invasive therapies confirm the surprise but had no tools to record the event. PhotoMed’s team wondered, why not add capabilities to record the next event of “when” something really cools happens? 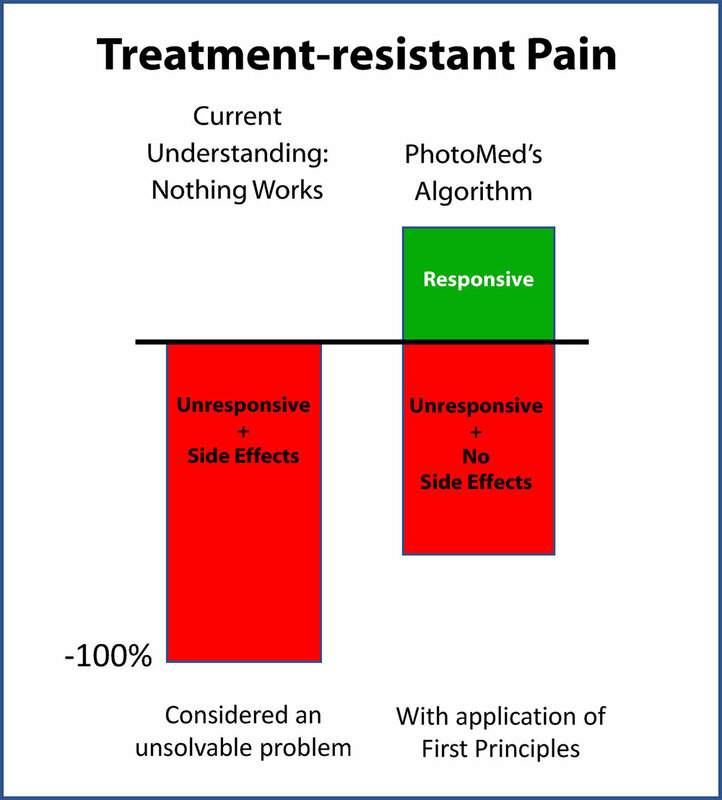 PhotoMed’s team applied strategies from other industries to solve treatment-resistant pain and impairments. Today, the Instant Feedback System™ and algorithm record events in real time to possibly connect dots among treatment parameters, physiological responses, and outcomes. Figure 1 - The Instant Feedback System™ enables a solo practitioner to manage visits which include real-time recording of treatment parameters, physiological responses, and outcomes. The modular System is designed to manage studies in small clinics or in the field. 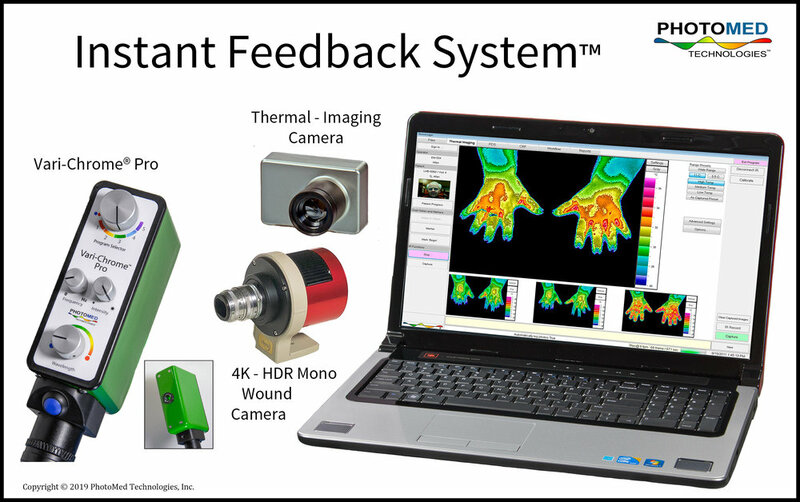 Thermal imaging provides feedback from disorders that include signs of abnormal thermoregulation. The 4k - HDR mono camera records the entrance of fresh materials entering non-healing wounds. Use a USB camera (not shown) for capturing discoveries and for documenting sensory or motor testing. There were no side effects, other than disappointment, when the therapy didn’t work. The new algorithm doesn’t work for everyone. However, improving function for about 1 out of 3 people is a lot better than zero. Today, 2 visits are enough to learn if the therapy probably won’t work for the individual. Physiological responses and outcomes, when the therapy worked, puzzled PhotoMed’s advisors. Many volunteers arrived with multiple sites of pain and impairment. The team expanded the duties of the Instant Feedback System™ to simultaneously track progress of multiple disorders in the same person. The methods came out of Silicon Valley’s playbook. Coordination among associated impaired functions. Note that the definition of the pain experience does NOT require an “ouch” factor. Thank you for sharing your story or asking a question. You should expect a response within 2 working days. Please call Allan Gardiner for detailed questions.